The Ultra Beaumont Luxury Bridge Basin Mixer Tap is part of the Ultra Traditional Bathroom Taps Range. This perennial favourite collection of basin taps and bath shower mixers capture the aura of a bygone time. The Beaumont tap and mixer collection is the perfect partner to the Beaumont showers range. This uniquely designed tap will add luxury and enhance the look of your basin too. Q. can I get this tap with lever style handles? Hi, unfortunately this tap is not available with any other handle. You may wish to look at product code ker10 for an alternative. Thanks! 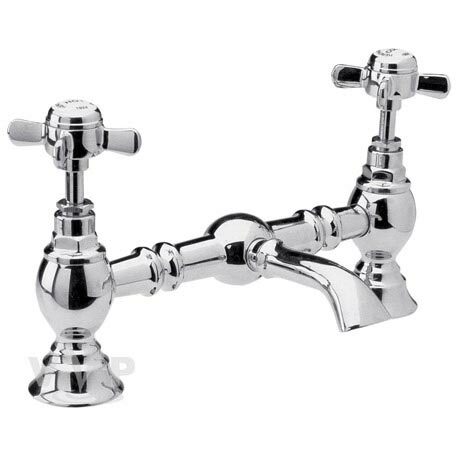 Q. I would like to know if these taps come in the antique gold finish? Hi Alice, no unfortunately this basin mixer is only available in chrome. Sorry we couldn't help more today. Ordering was easy. Delivery straight forward. Great quality product. Very pleased with the product. Packaging & delivery is excellent too! thank you Victorian Plumbing. The ultra luxury mixer taps installed easily and operate very well. No complaints at all - they look stunning and are easy to operate and work as expected.